Established in 2011 by a group of experienced IT professionals, CloudBerry Lab™ provides cloud-based backup and file management services to small and mid-sized businesses (SMBs). CloudBerry’s offerings include powerful, easy-to-use backup management capabilities and military-grade encryption using customer-controlled keys. Customers can choose to store their backup data with more than 20 online storage providers, including Amazon S3, Microsoft Azure, Google Cloud, HP Cloud, Rackspace, IBM Softlayer and others. CloudBerry also partners with thousands of VARs and MSPs to provide them with turnkey, white-label data protection services. CloudBerry Lab is an Amazon Web Services Advanced Technology Partner. 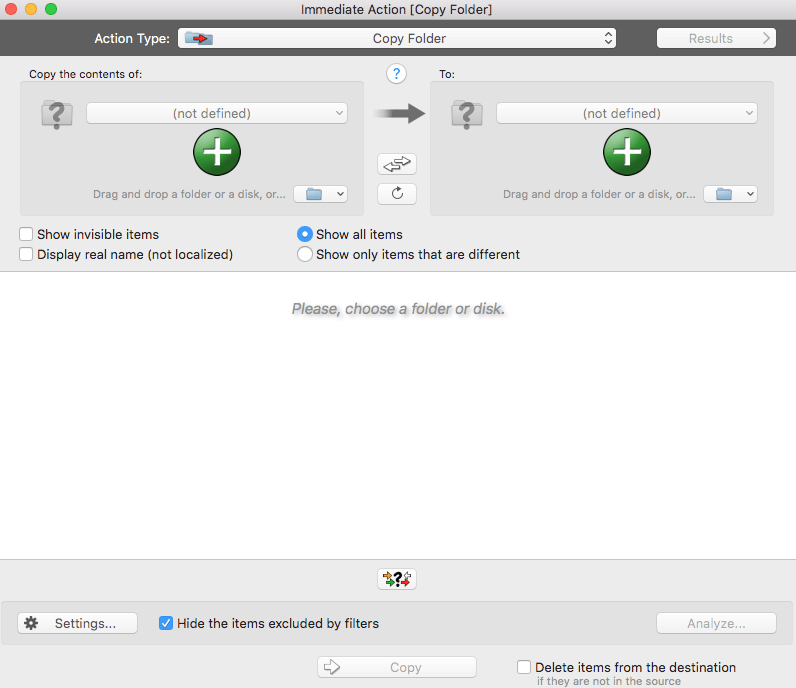 Installation of Cloudberry Backup is easy, just drag the application icon to your applications folder and you’re set. 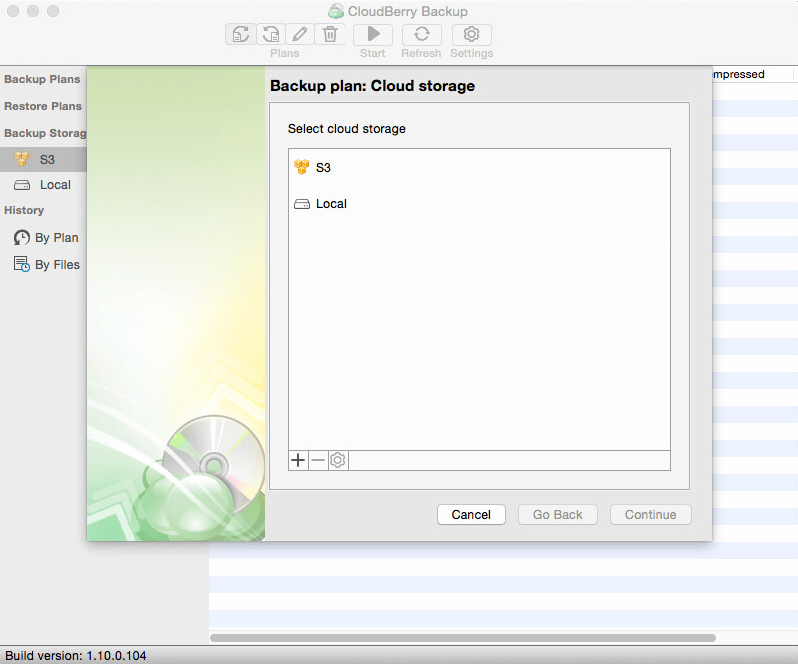 Cloudberry Backup being a backup tool for almost any cloud based storage, only needs the login credentials from your separate bought cloud storage. These days, an offsite backup is typically uploading data to a site on the internet and is called: cloud backup. 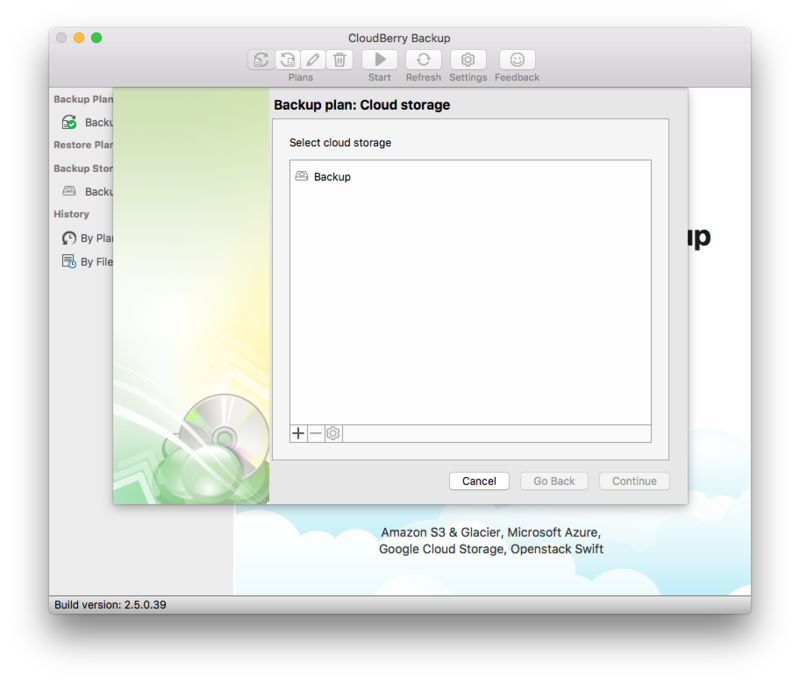 Simply put, CloudBerry Backup for Mac serves as a conduit between your Mac and your cloud storage provider. 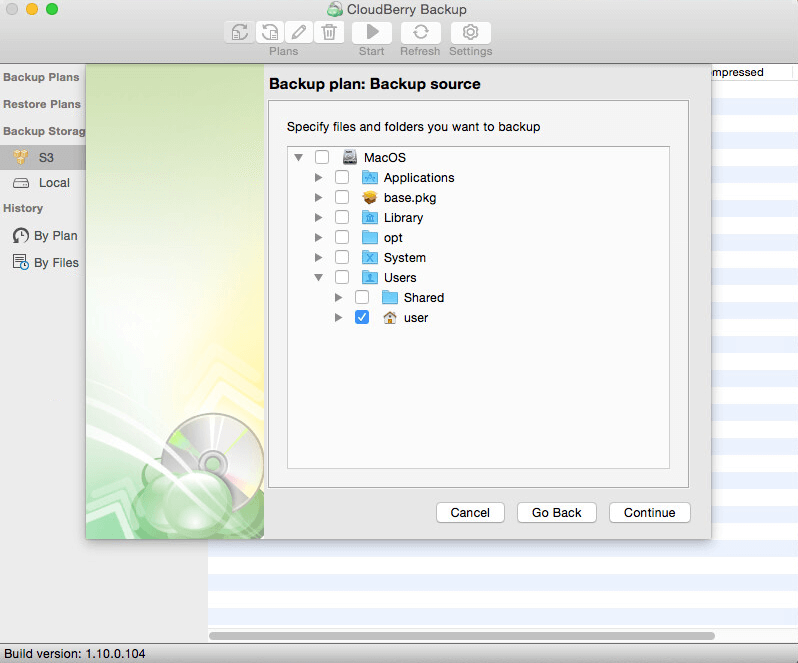 You set CloudBerry Backup to which files you want backed up where and when, and Cloudberry Backup takes it from there. 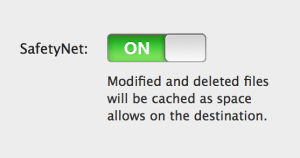 In addition, there’s an option to back up data to a hard drive connected to the Mac. 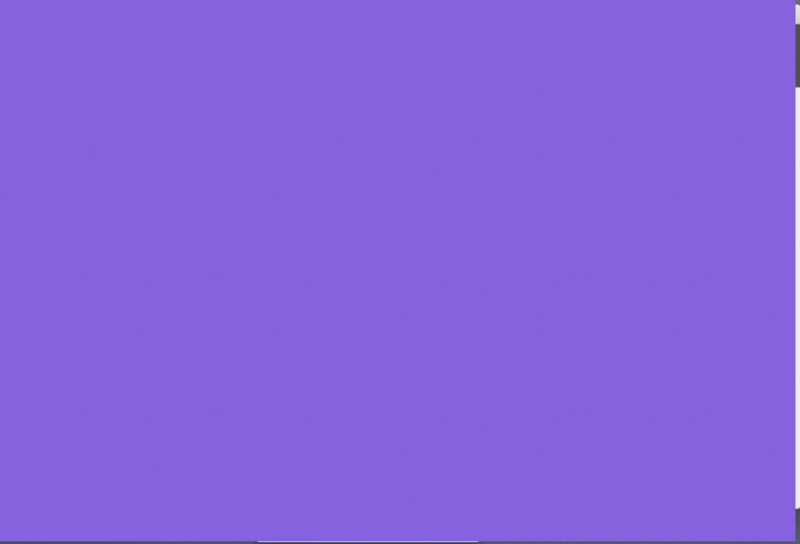 The initial interface presented is shown below. 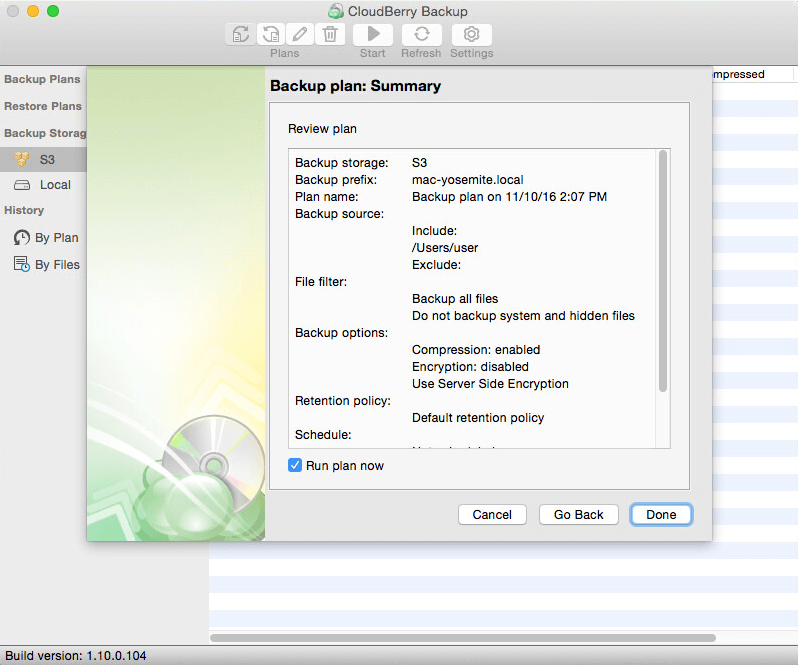 Some things you need to know about Cloudberry Backup. In other words, what you get and what you don’t get ( Cloud storage itself ). 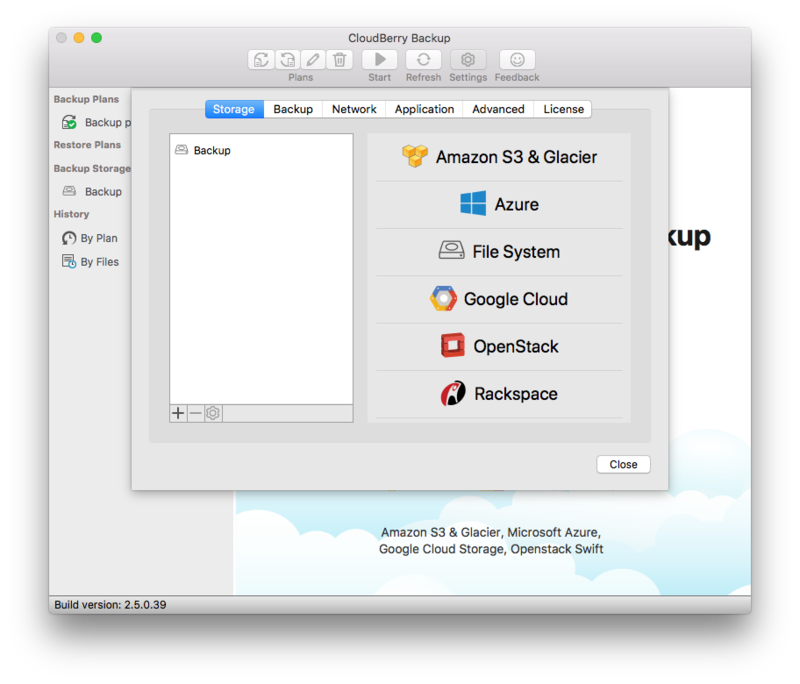 With CloudBerry Backup you decide where to store backups: Amazon S3, Microsoft Azure, Google Cloud or other. CloudBerry Backup doesn’t process your data on 3rd-party servers, all data transfers occur between the source instance and a storage account you control. You don’t need a CloudBerry Backup commercial license to restore your data. You can configure your data retrieval right from the product activation screen. Well Cloudberry is fully equipped with all possible cloud storage services. 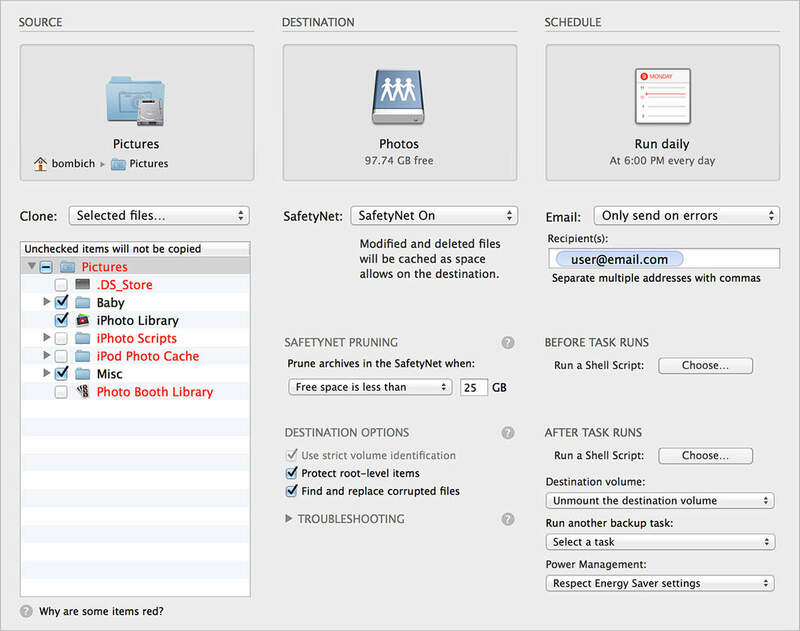 Scheduled Backup Build flexible Mac backup schedule for files and folders. 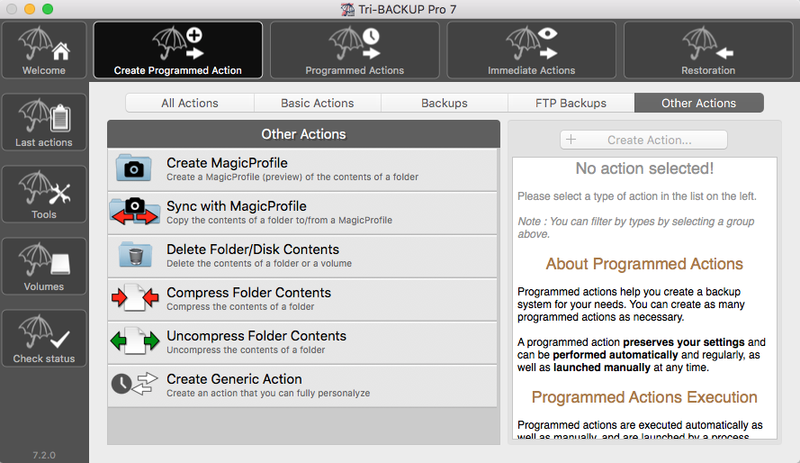 Incremental Backup Backup only new and modified files after the initial full backup. 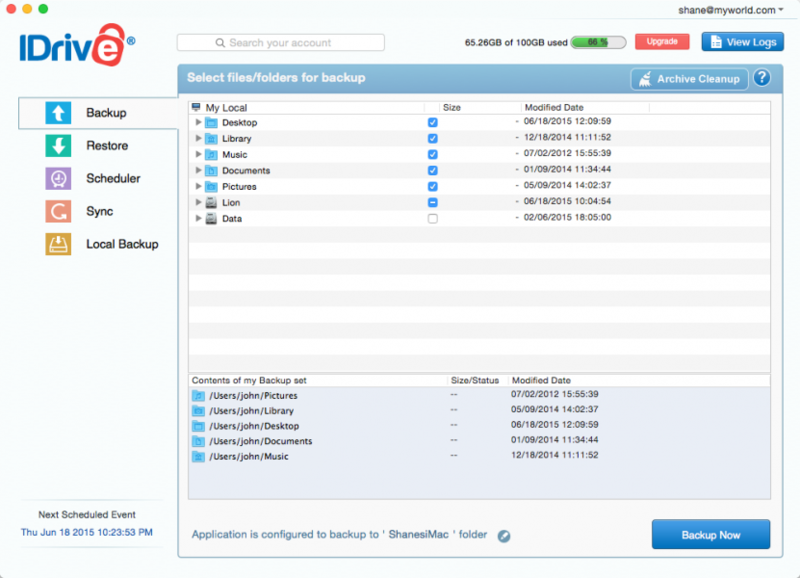 Block level backup Backup only modified or new portions of files to add them to existing online data pool. Command Line Interface Use the Command Line Interface to integrate backup with your own routines. Compression Reduce data overhead, decrease storage costs, aid bandwidth and accelerate backup completion with optional compression. Retention Policy Set up retention options to enable automated deletion of outdated data from your storage. 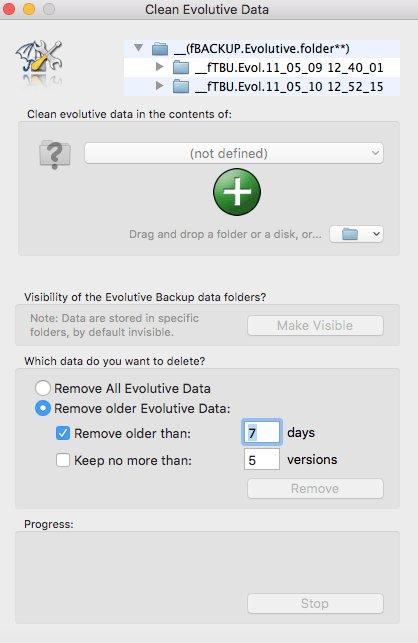 Keep only actual versions of your backups. 256-bit AES Encryption Encrypt backups with up to 256-bit strong keys on source side. All data sent to the cloud is encrypted using the SSL protocols to protect while it is in transit. Email Notifications Set up customizable email notification feature to track each run of your Mac cloud backup and restore plans remotely. 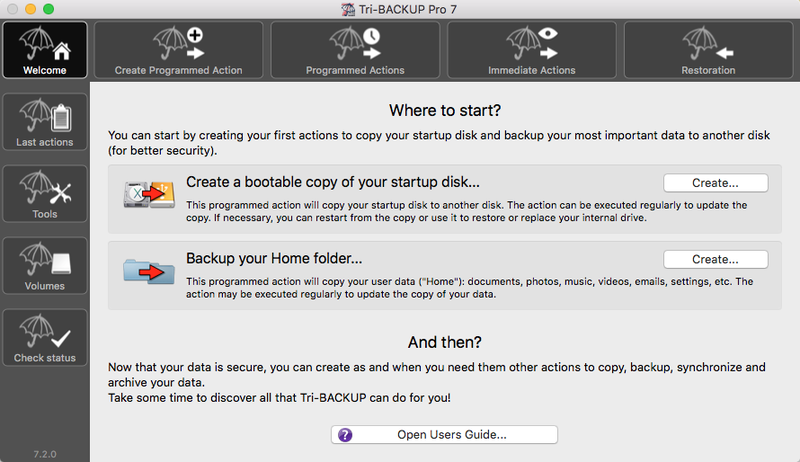 Local Backup Backup Mac to cloud storage of your choice or set up local backup if you want to send only a subset of your data to the cloud and keep the rest on your local backup storage. 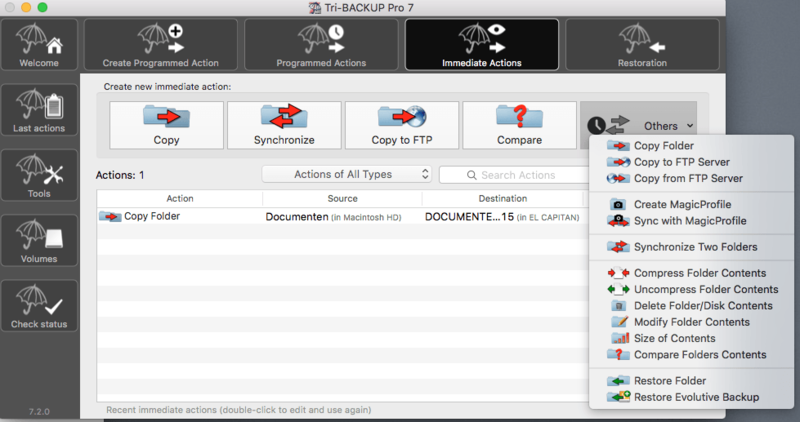 Network Locations Backup Back up your network locations including network shares, NAS devices, mapped drives, etc. Symlinks support Maintain correct file structure and backup only what you need. 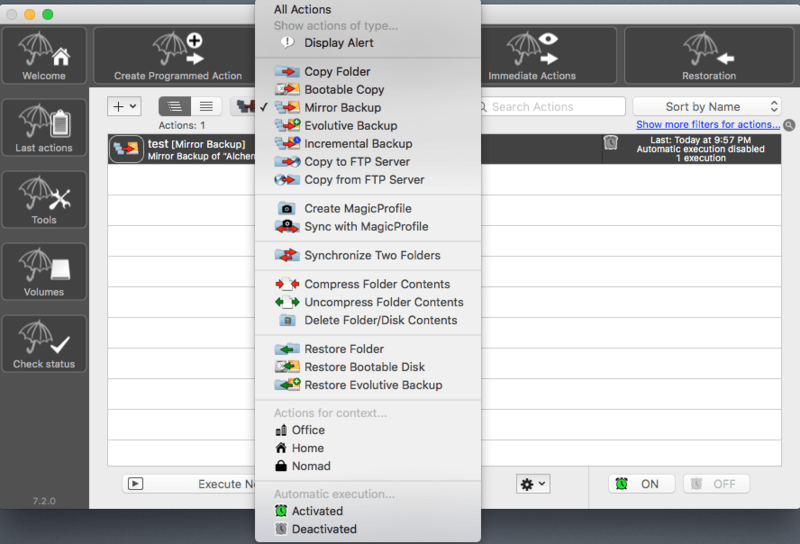 Full system backup Centralized backup of all files and settings of your Mac. Support for Apple File System snapshots Seamless backup of files in use. Support SFTP as a storage destination Backup to a network resource via SSH-secured FTP. Support SMB as a storage destination Backup to a network resource via SMB/Samba. 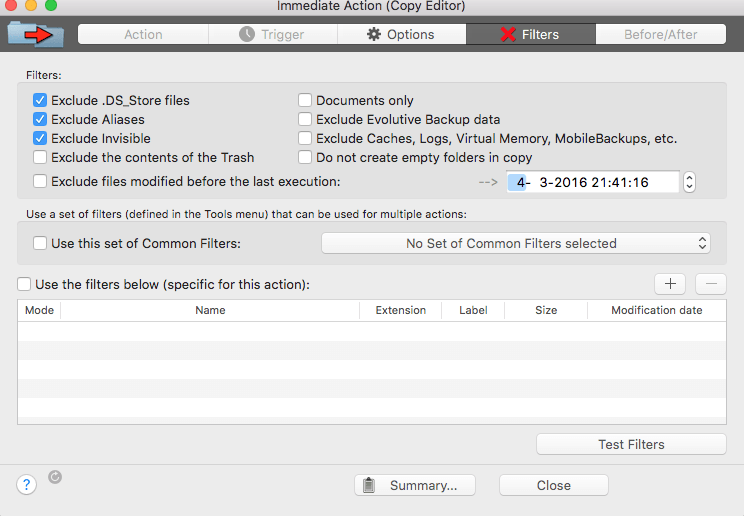 Pre- and post actions Configure additional actions prior or after the backup job. Detailed report Discover the detailed picture on the results of the previous backup jobs. Once you have selected and aquired (a paid account, or not) your cloud storage service provider, you provide the credentials to CloudBerry Backup. These details (such as Access Key, Endpoint, Bucket, Container, etc.) vary by provider, and CloudBerry Backup will ask for the details it needs, based upon the provider you choose ! Good, as this is only for more experienced users and not for novice users. Setting up the details is something that needs knowledge. There is no Dropbox or Google Drive to select from the services list. Checking the list of providers, I feel this application is not really for the average Mac home-user but rather for a business or a professional user who keep their data in a safe place beside the common Dropbox, Google Drive or iCloud which is far better integrated in your Mac system. 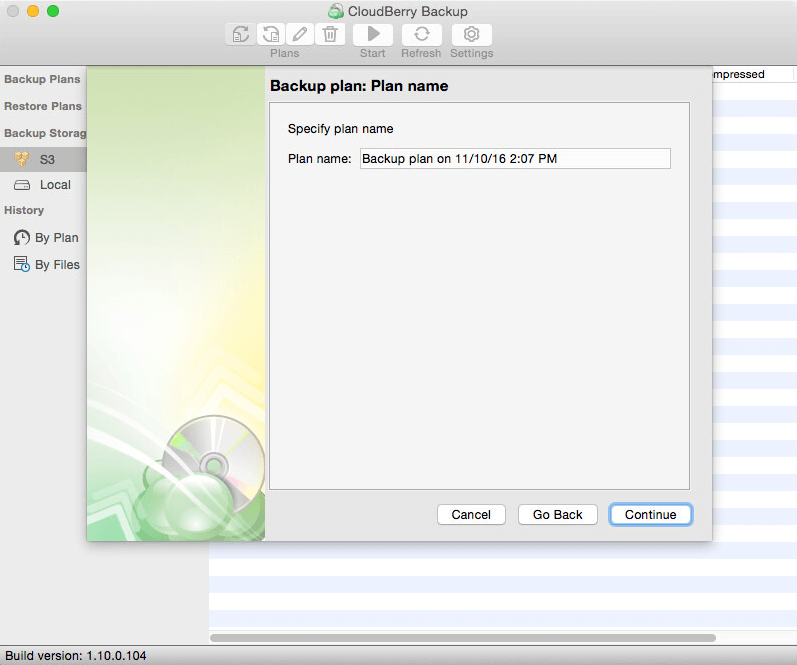 The verdict for Cloudberry Backup for Mac is positive overall. It supports many cloud services, and is loaded with features. 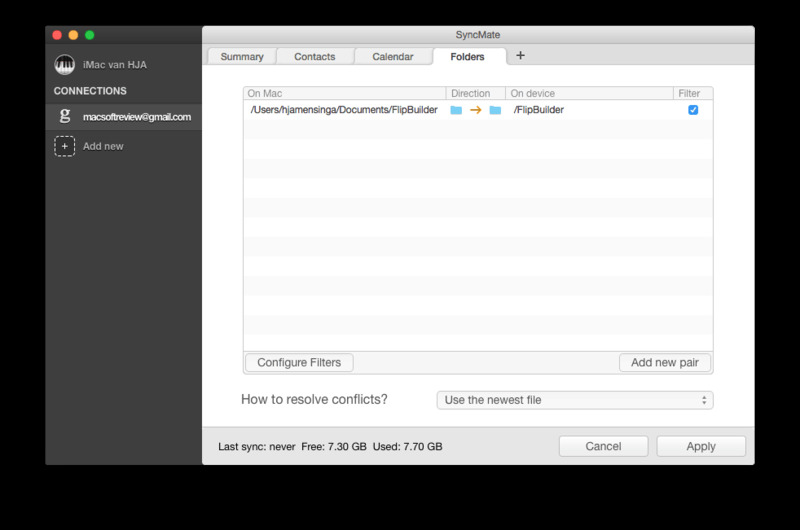 The Pro version adds (local) compression and encryption of your data before uploading to the cloud. 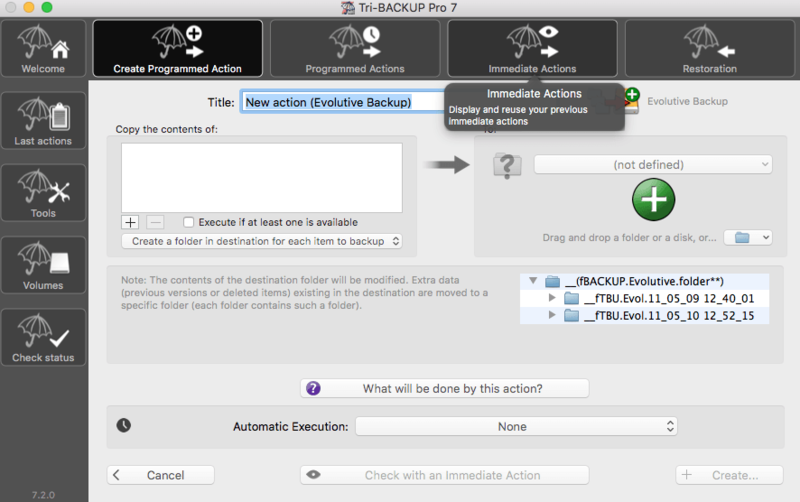 It all works rather well and the Assistent helps you out when creating a backup or restore plan. The overall interface is not really my cup of tea, but it works well for what is was designed to do, and provides all information. 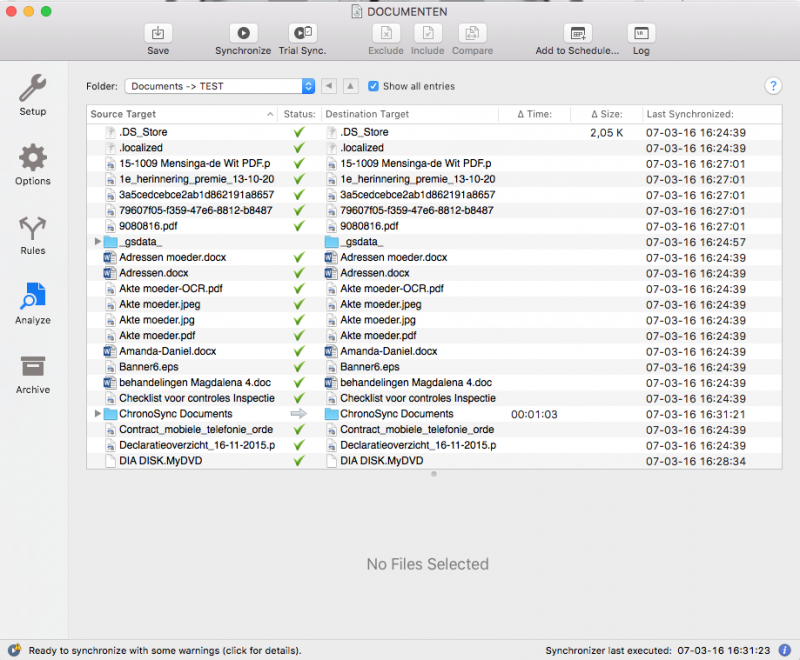 The support for Apple’s new AFS file system is according to the website a coming feature. An absolute must knowing Mojave will be released on 24 September 2018. 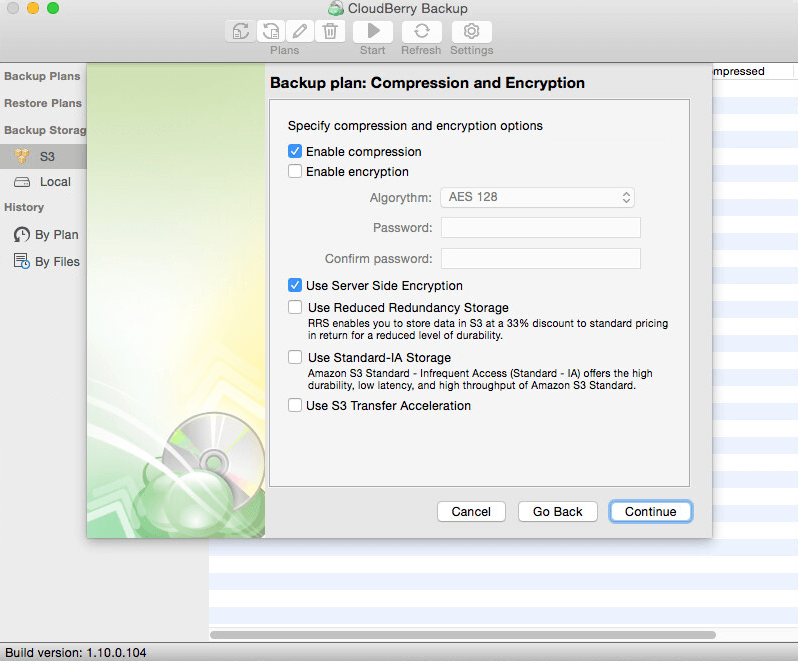 Cloudberry Backup is most useful for those having multiple cloud services running. Not recommended for novice or casual users, but good for any professional. Eltima is a software developer for Windows and Mac related applications. They are in business for 15 years and provide smaller but useful utilities. 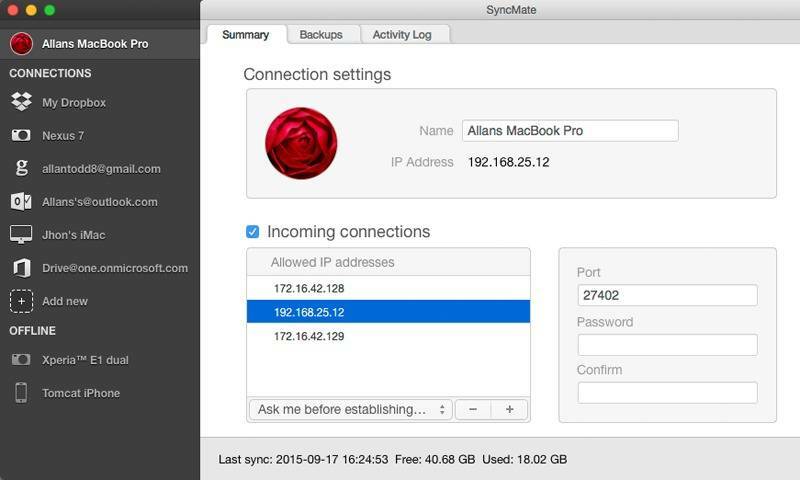 SyncMate and Folx Pro are some fine examples of their applications. 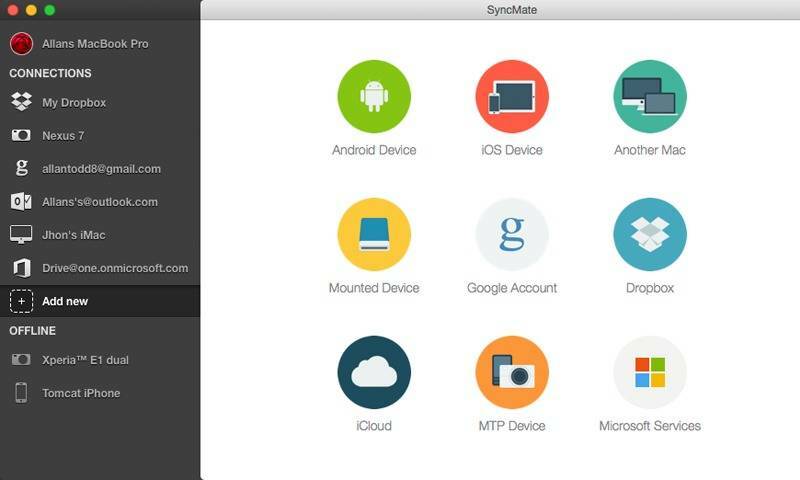 This time we will review their SyncMate Expert application and see how it performs. 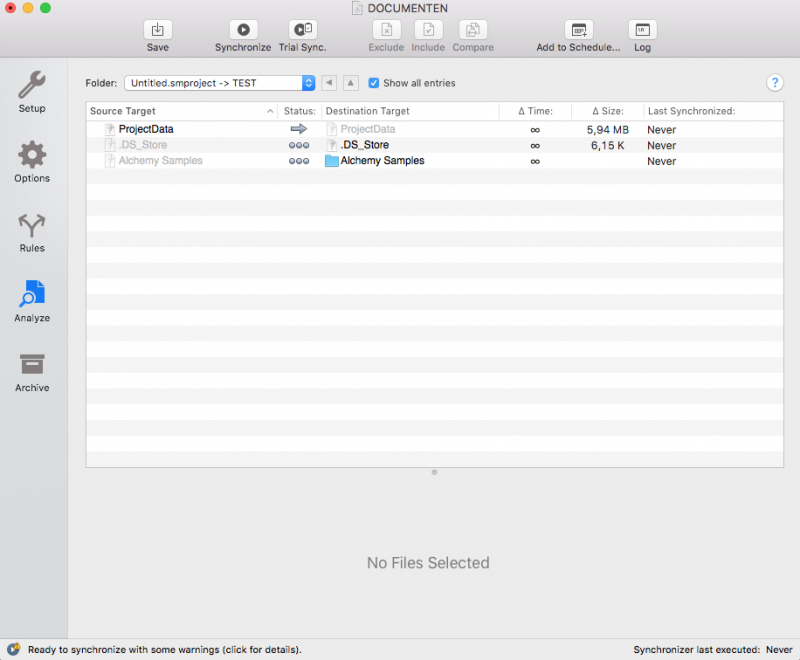 The SyncMate Expert edition is an ideal backup manager. 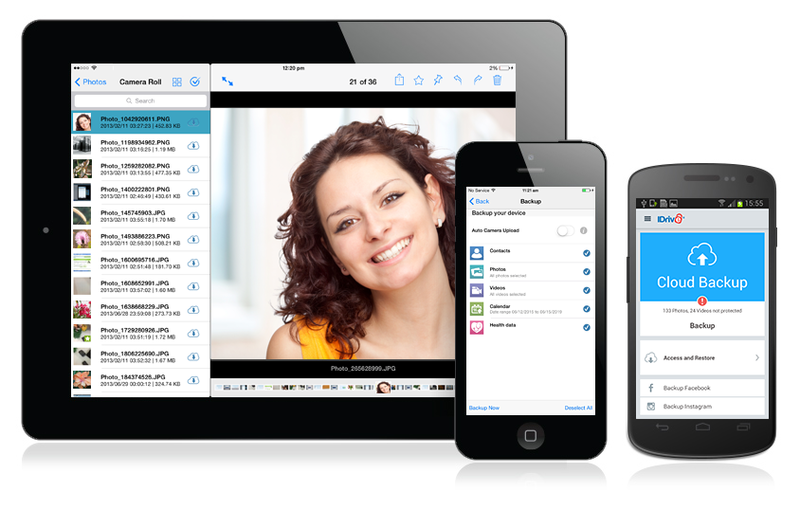 It syncs everything in your phone like Messages, Images, Music, Documents, Reminders and Call History. One of the nice features is the expert edition also allowing you to manage your phone from your Mac. Just use your Mac for typing and sending messages, a useful and neat feature I think. 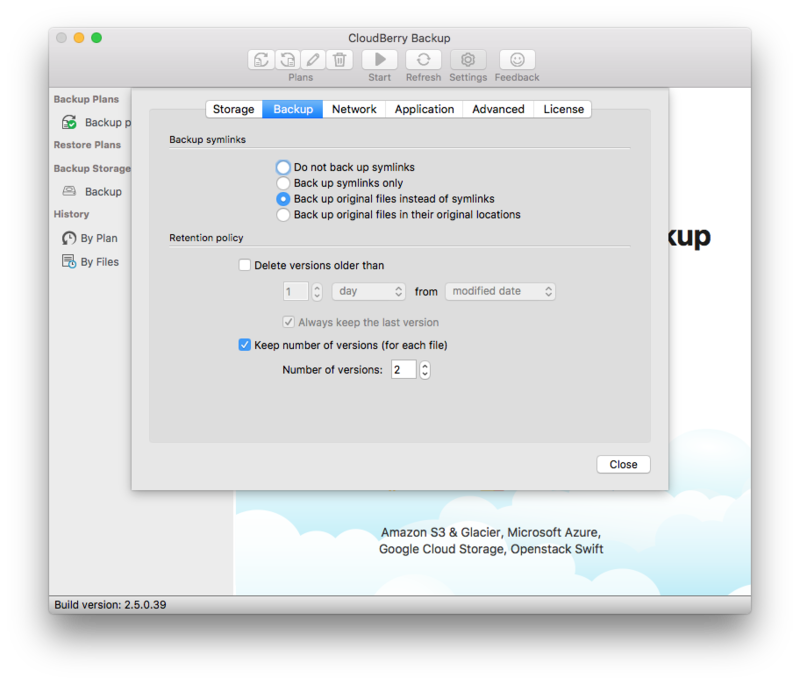 The ability to mount your cloud storage data as a local disk is a nice extra bonus to a full backup and sync utility. 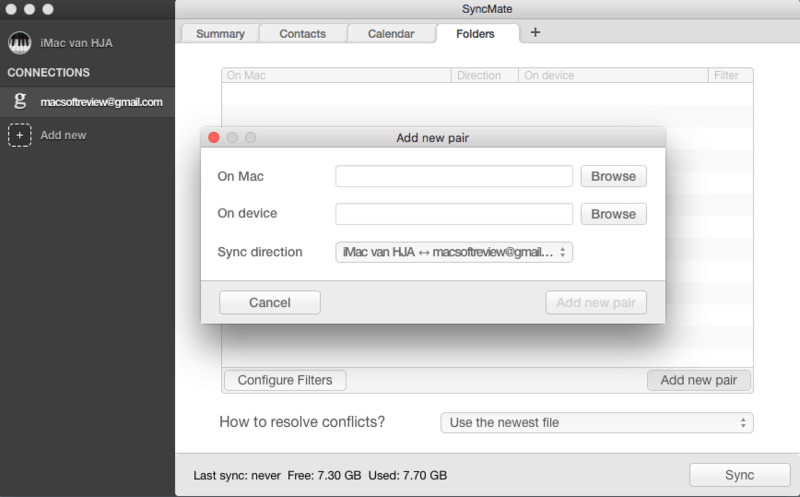 SyncMate features own Sync Service which lets you sync locally avoiding any cloud mediums in OS X 10.8.5 and later. In this way the sync process is secure and safe, and you totally control your data. 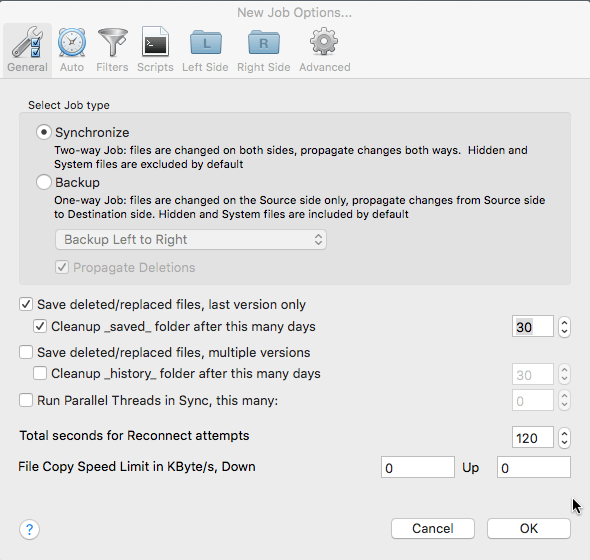 Eltima SyncMate installation is straightforward, just drag the application to your Mac applications and you’re set. Now its time to make your choices in items you wish to sync with your other devices. Your Apple OSX itself sync’s trough iCloud with your other Apple devices, but Android for instance is not achievable without any third party software. 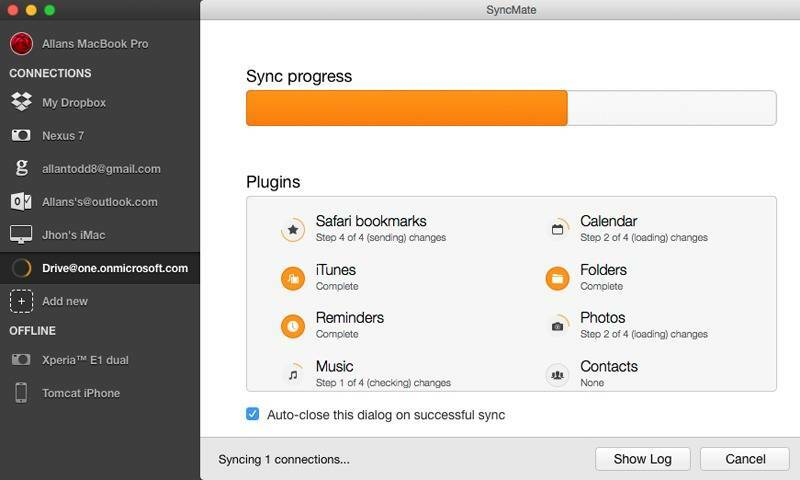 SyncMate Expert will give you the possibility to sync with your ‘cloud’ storage like Google Drive and Dropbox. Just hit the button of your choice and fill the credentials and approve of the access to your cloud-account. 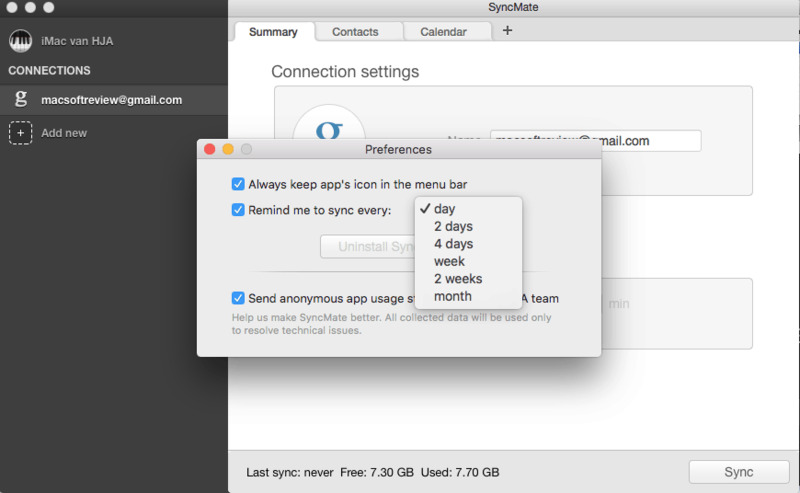 Syncmate will provide a popup asking for access to your contacts. Pay attention to the default marked anonymous app usage statistics sending to Eltima. If you feel you want to keep your data private uncheck the box ! options to an account or connection type, just add by choosing the ➕ sign. The Autosync option provides a kind of scheduler which is really basic. I would like to see a full scheduler integrated in the utility which makes it far more useful. 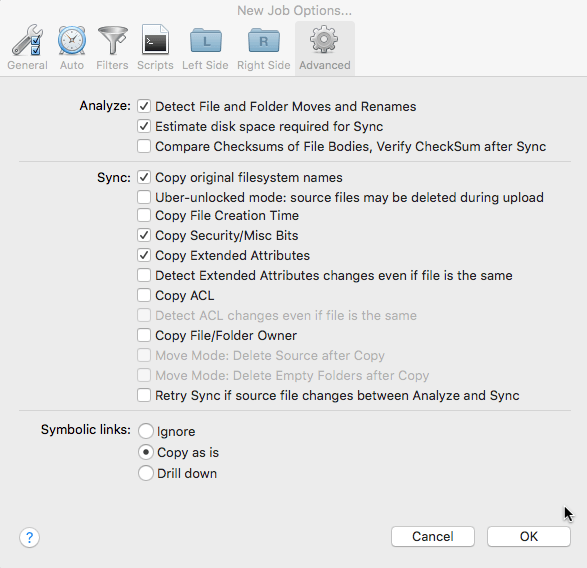 All possible sync options proof this application to be not your ‘pandora box’ , but your ‘panacea box’ your swiss knife for syncing your data with your devices. 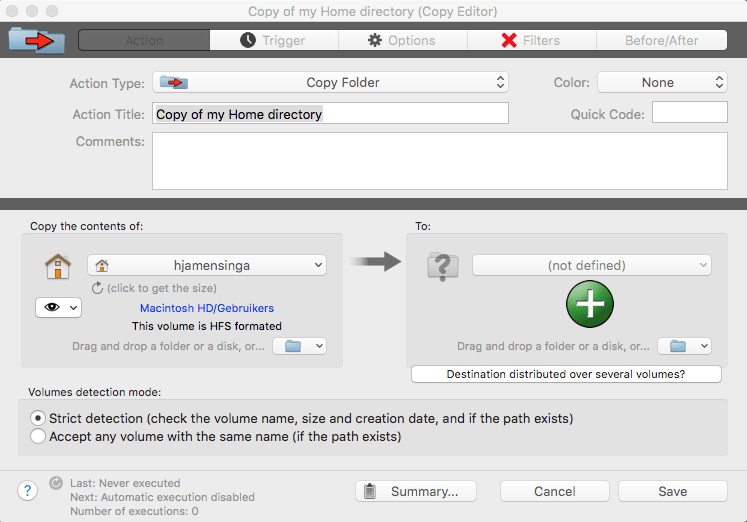 Mounting cloud storage as a local disk, is easy to setup. A disk will be shown on your desktop. 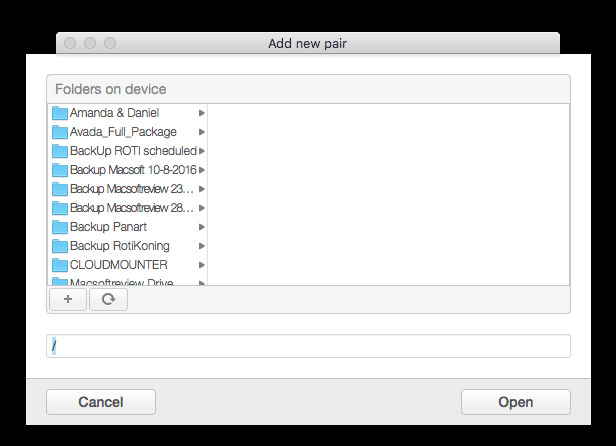 Check the box MOUNT and ADD new pair, choose sync direction and setup the desired sync folders or files. Now you may set the period for required sync. You will be notified after every synchronization. 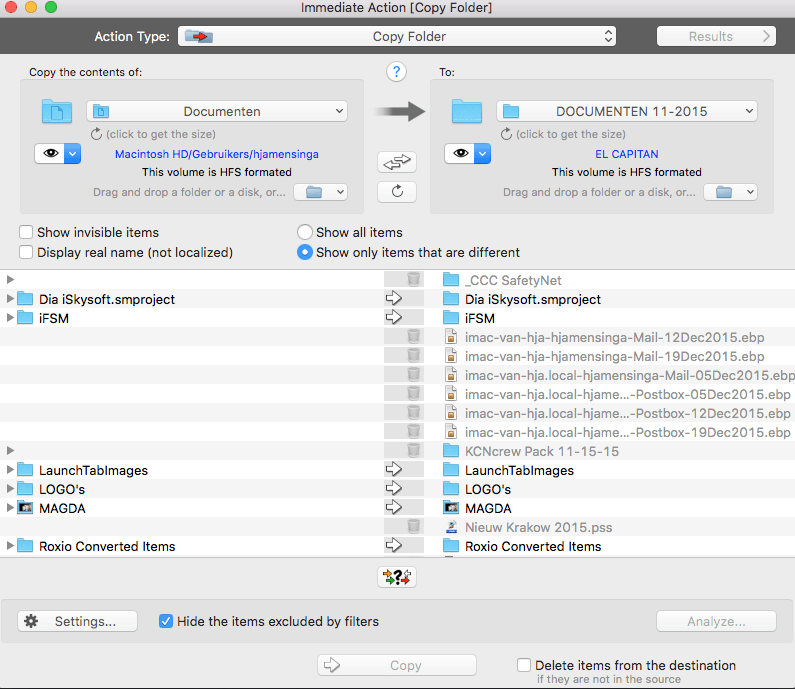 A log file is created and visible also during sync. OSX Fuse installation is necessary for mounting cloud storage. 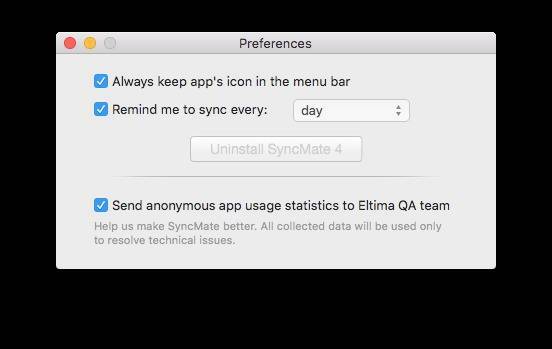 Eltima SyncMate takes its job very serious by syncing all your devices like Android and iOS, MTP and storage devices and Microsoft Office apps. 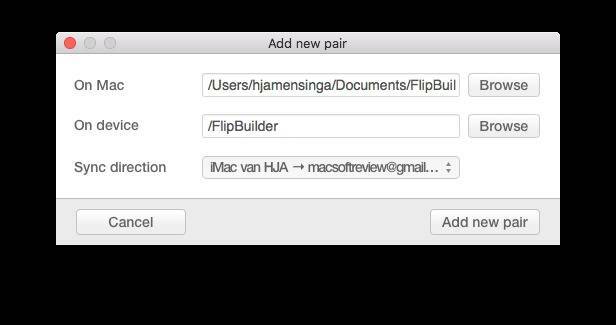 Its the ‘ yin – yang’ solution for keeping your stuff synchronized. With its clean and clear interface, it makes life a little easier providing you the ability to use your data on any of your devices. Just use your Mac for typing your messages and send it from your phone. 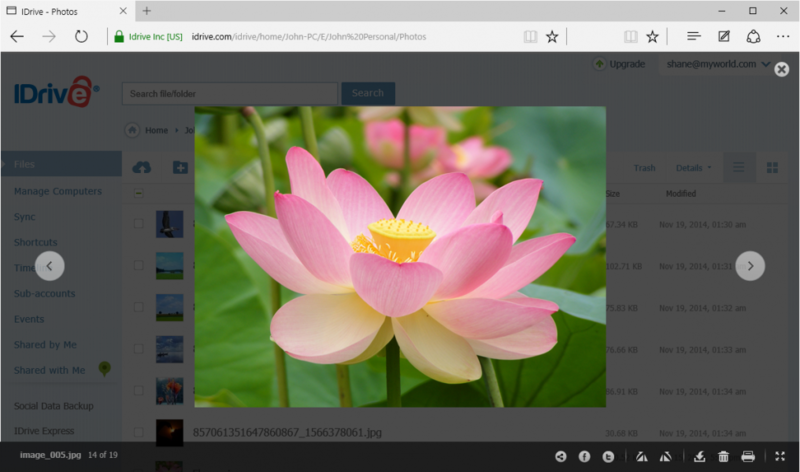 The mounting feature of your cloud storage places complete a great utility. The scheduler / auto sync time feature needs some upgrading but still this is a great sync utility a full 5 star recommendation. 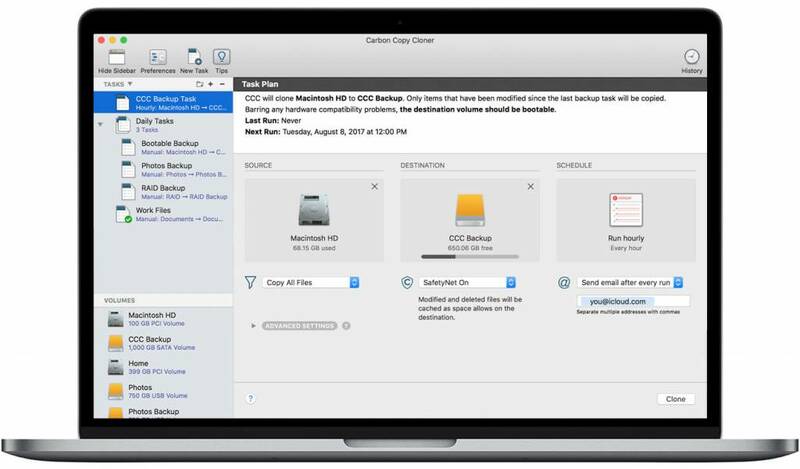 iDRIVE provides several backup and storage options for private users and businesses small and large. This review is about the personal 1 TB cloud storage space. They also offer a free 5Gb plan FREE of charge. So if you want to try out or find 5GB cloud storage enough, setup your account for free. There is a lot to choose from on the internet when it comes to cloud or web storage providers. Choosing becomes even more difficult if you consider the cost and provided storage space. The Personal account offers 1 TB storage ! For private users 1 TB storage is more then enough. Just compare iCLOUD extra space 50 GB for about $ 12 a year. iCLOUD however is integrated in OSX which makes it a little easier to work with. 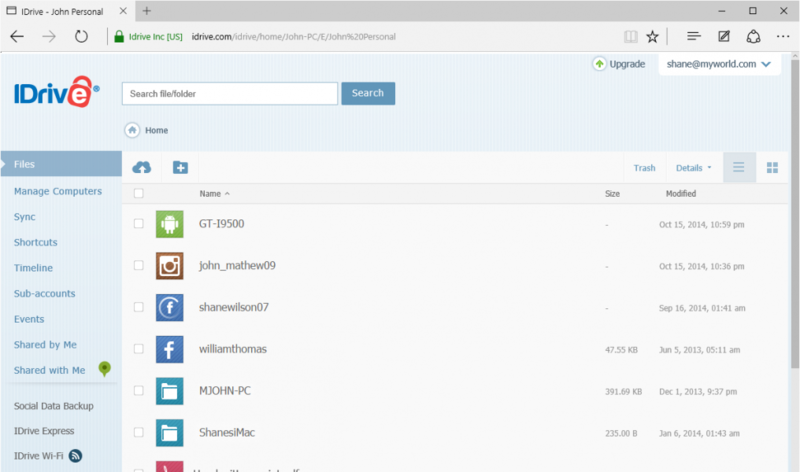 iDRIVE is an easy to use backup utility, is safe with 256-AES encryption and supports sharing. Web-based console helps you manage data backups, restores, application settings and more, on your far-away computers. Access files backed up from PCs and Macs or synced from connected devices; protect your mobile data with our apps for backup. Search and restore files from the desktop application or via any browser; provision to recover deleted files within a period of 30 days. iDRIVE has a Windows like interface ( shame ), and a intuitive layout. You don’t have to be a rocket scientist in order to work with the iDRIVE.app. 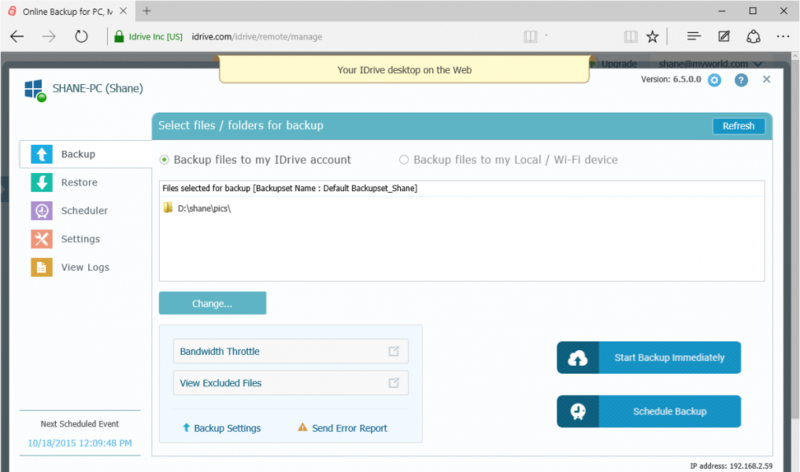 So how fast is iDRIVE cloud backup ? 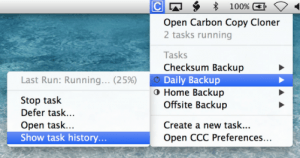 Backups are great and necessary, but if things go too slow it starts to frustrate! Only one way to find out and thats measure the upload time to the iDRIVE server.I had data packages prepared of 5 GB mixed data. 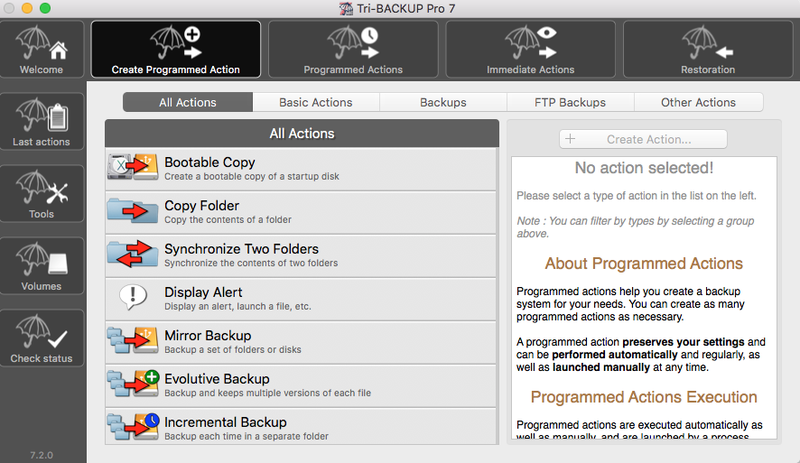 Backup and Restore both get an average transfer speed of approx. 9.5Mbps. Google Drive scores an average of 9.5Mbps and Dropbox is 2.4Mbps using the web upload. 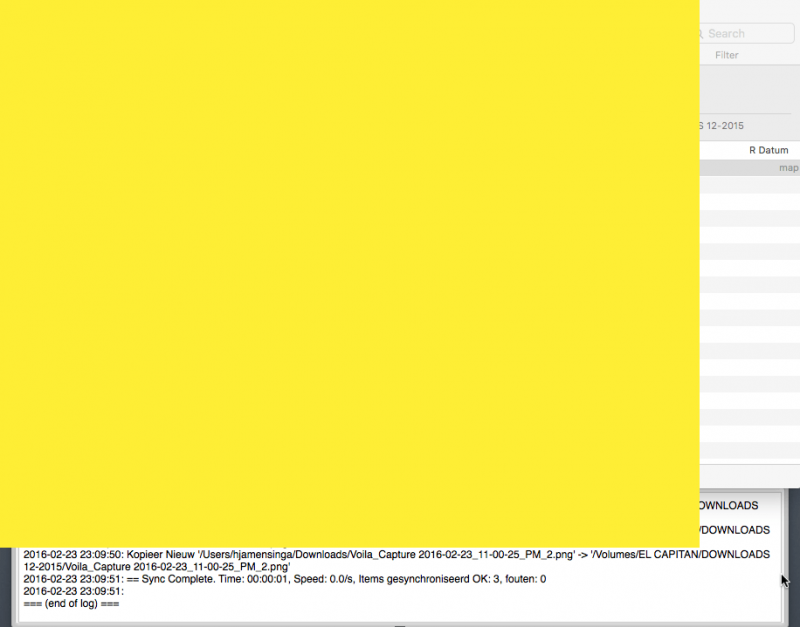 Dropbox is really fast when using the desktop.app on OSX. Dropbox and Google Drive are good when it comes down to speed. However they don’t offer any kind of security or syncing options. 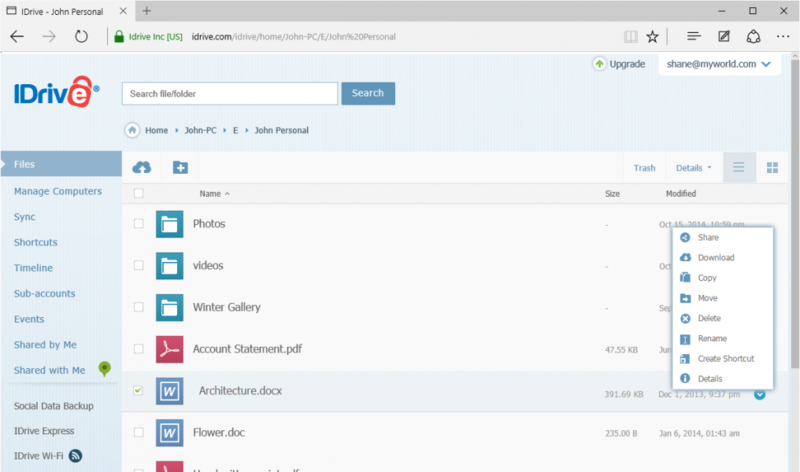 iDRIVE performs really well with uploads and downloads through their iDRIVE backup-interface. Setting up only takes a few simple settings. Once you downloaded the app in installed you need to sign up or login for an account. Now configure the wanted encryption or use of password. – It is a really good thing that iDRIVE takes security serious and provides 256-bit AES encryption ! Decide which folders or files to backup. Press Backup Immediately or Schedule and you’re on your way. It is really easy for every user to adjust and use this application. Delete and restore functionality is also part of the application itself. 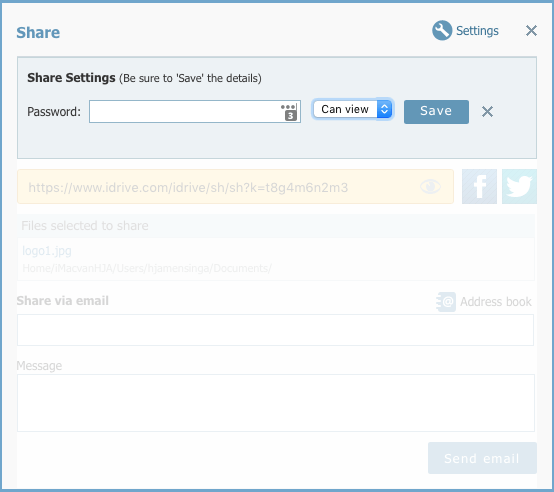 Share with PASSWORD is through the web interface of iDRIVE ! 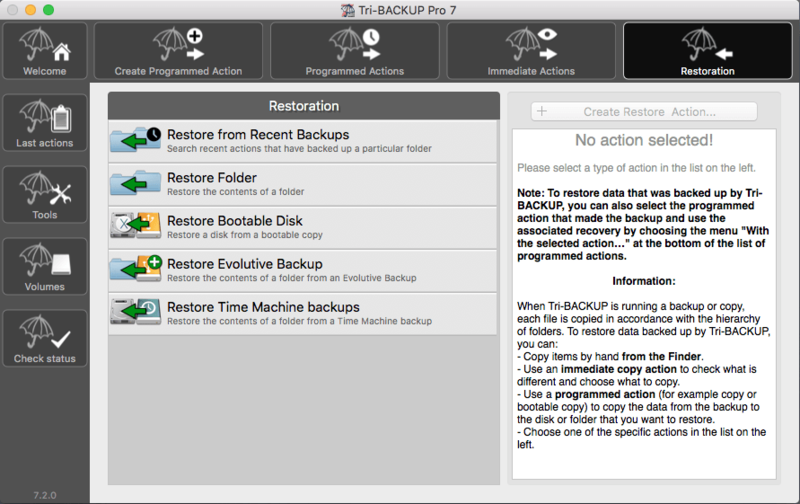 Time Machine Backup is possible and integrated. iDRIVE really impressed with a fast and clean performance. An easy and intuitive layout of the interface and a great price completes this great deal. 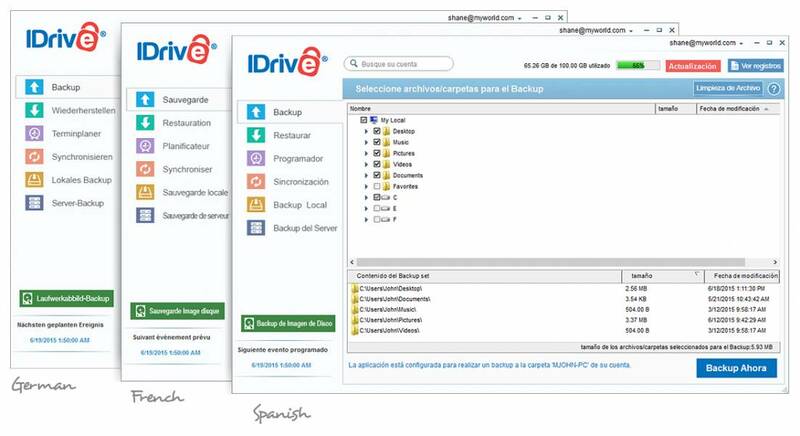 If you are looking for a Cloud backup that supports true security, speed and sharing options iDRIVE is your best option. 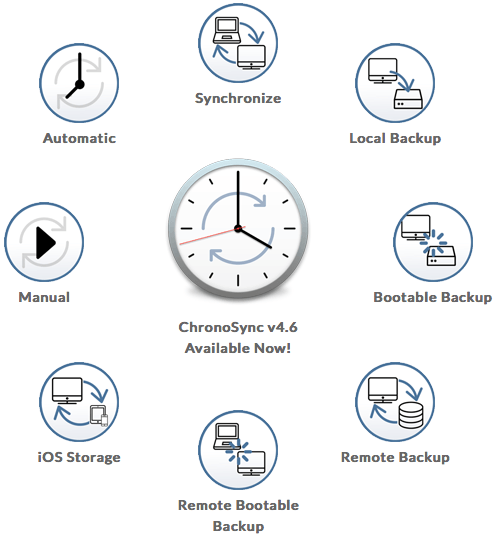 ChronoSync 4 is yet another backup utility, but unlike most competitors it has a clean, modern and intuitive interface. All features you expect from a well known and reliable company. Just backup your hard disks while you attend to your other duties and get notified when everything’s done. Just as simple as that. It also covers IOS backup and bootable remote backups. Check for the options and rules for customizing your operation. 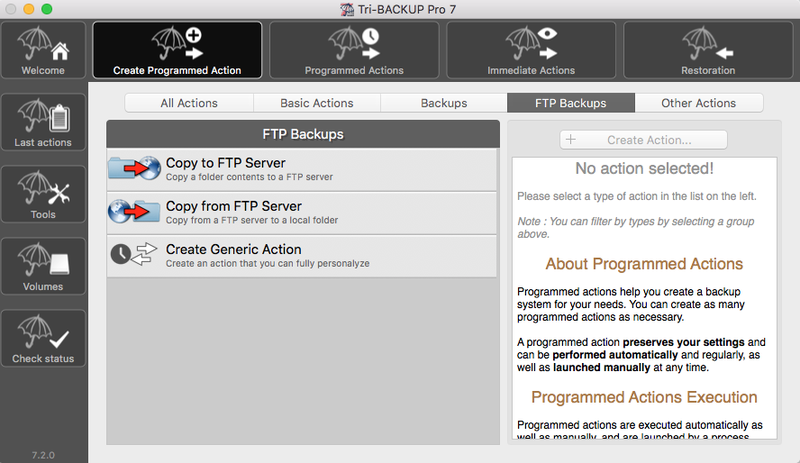 The figure below shows all possible backup and sync options, which support your private rules and scheduling. 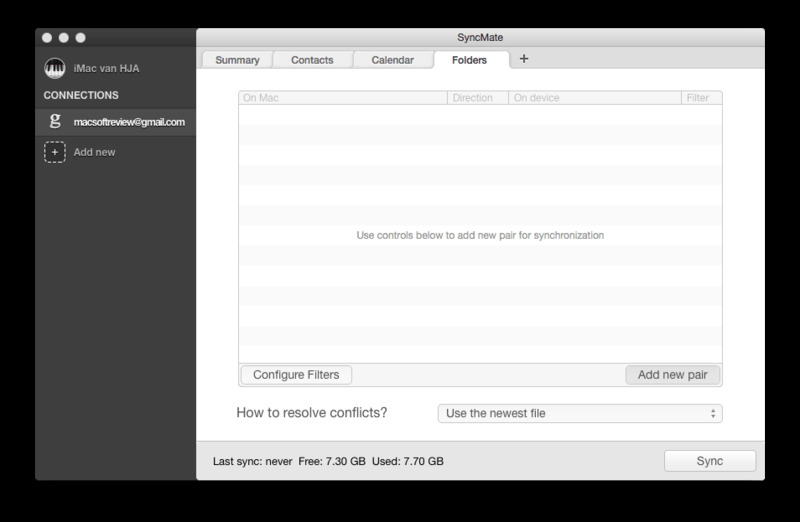 ChronoSync 4 is a perfect example what a modern interface should look like. It is like Danish design watches, clean slick and 100% functional. It is not loaded with features but adequate for most users. More is not always better ! 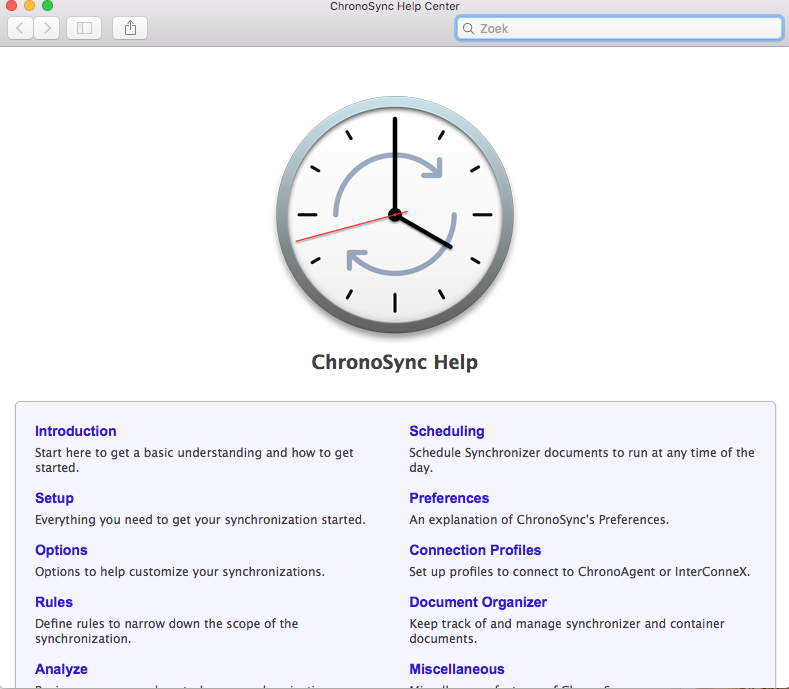 Installing ChronoSync 4 is straightforward and without a system reboot. 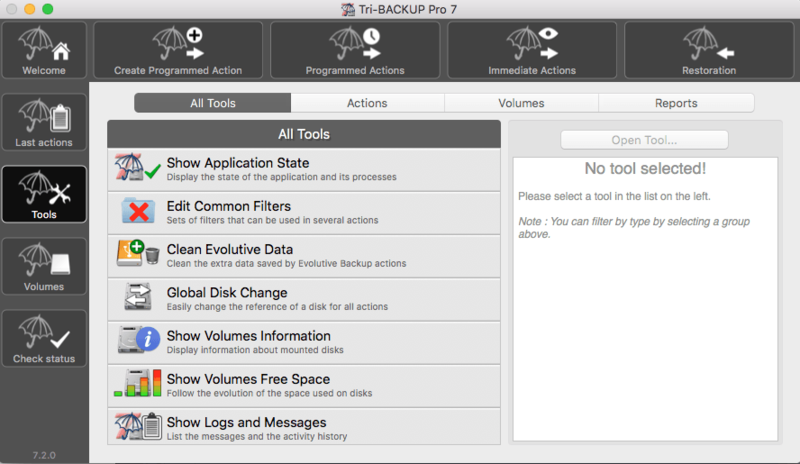 The right sidebar off the main page is used for creating your backup. 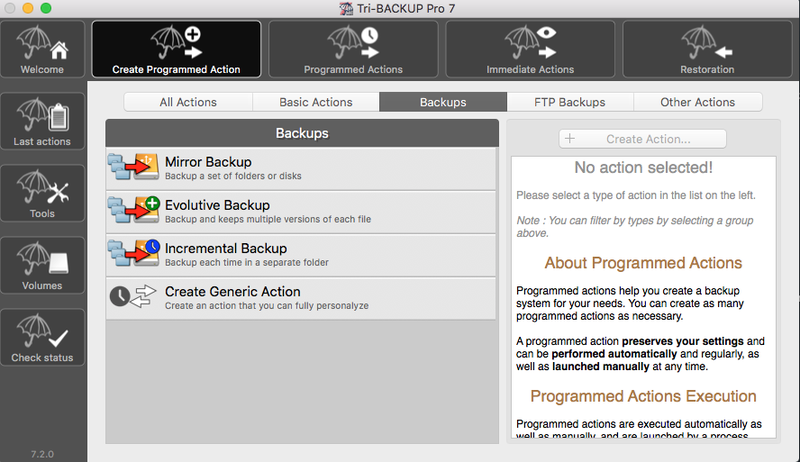 Now enter backup title and choose your desired backup operation, source and destination. 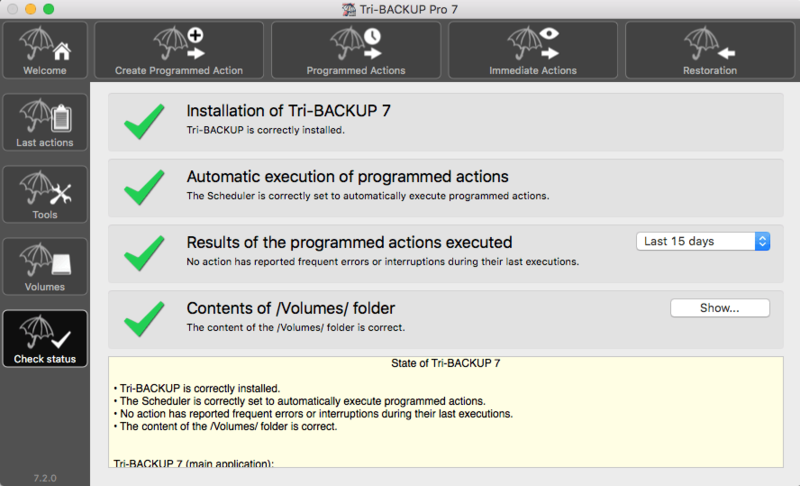 Options and rules are customized settings you may implement for your perfect backup operation. Again straightforward and congrats.. you’ve setup your first personal backup. 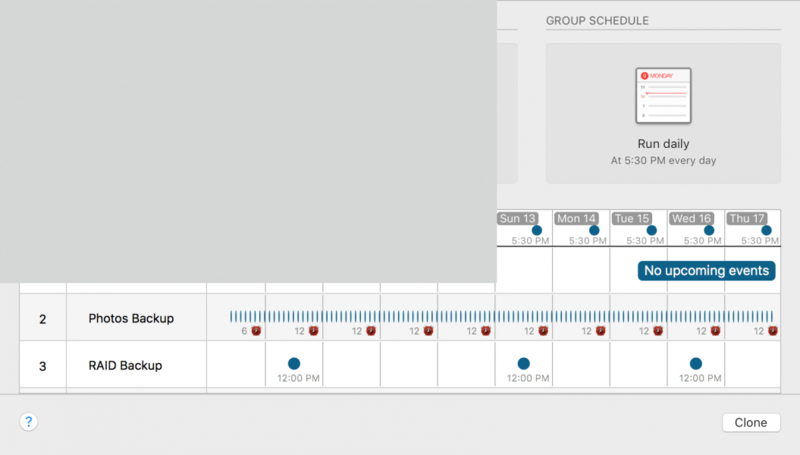 ChronoSync 4 has a brilliant Scheduling feature with a brilliant and complete interface. 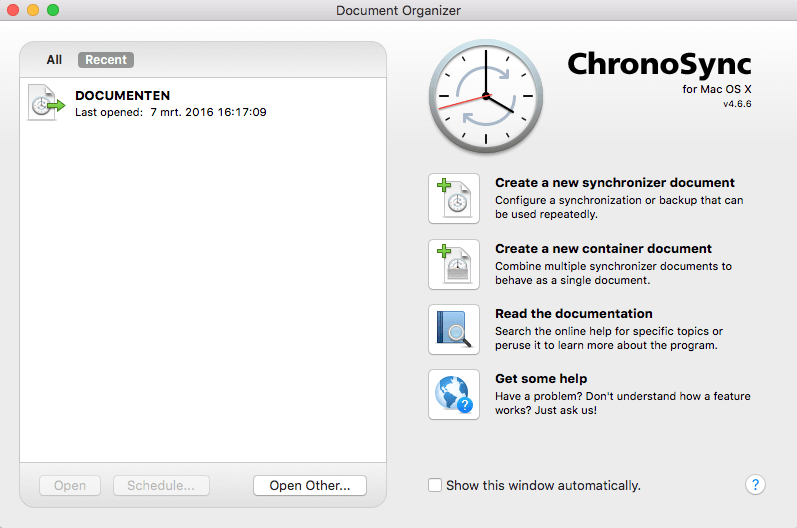 ChronoSync supports event-based schedules, too. 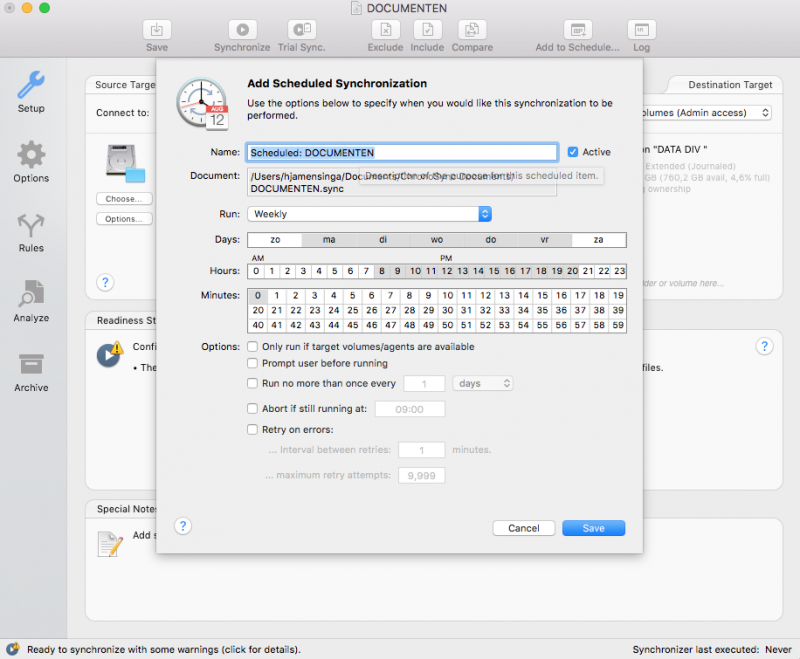 ChronoSync can even wake your Mac to perform scheduled synchronization. 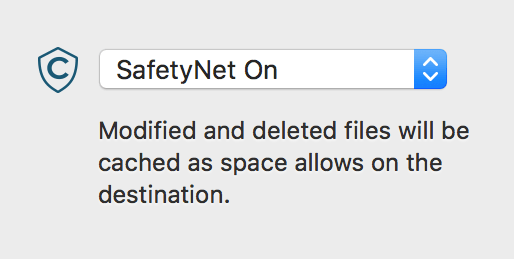 An option found on most backup utilities. This is the field of ChronoMonitor, and the pairing of ChronoAgent and InterConneX. 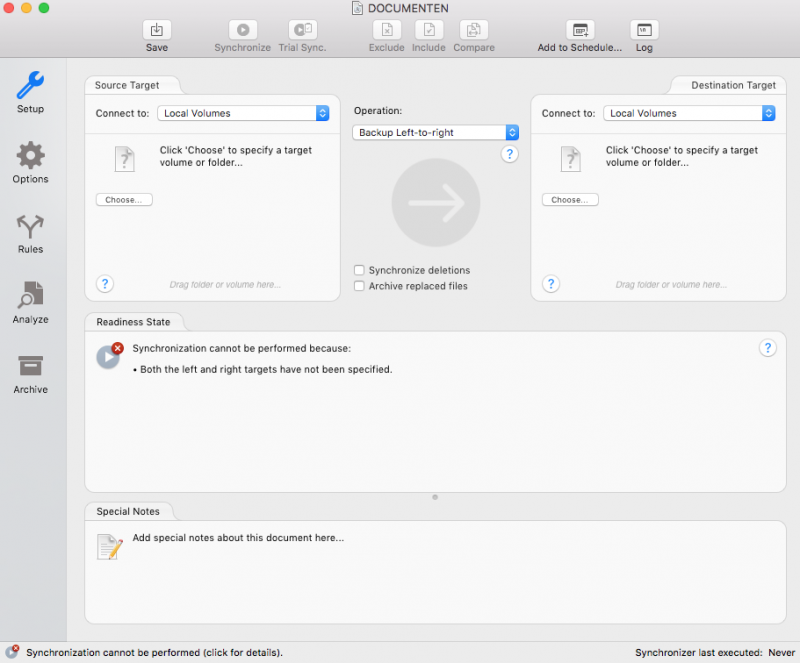 ChronoAgent is presented in system preferences panel: you install it like regular software, but without an application folder, it is an option within System Preferences. Switch it on in there, and when you create a secure username and password, you can connect to your Mac from another one, or an iOS device. You also need to install the Free InterConneX app on your IOS device and you’re all set. A brilliant program and a brilliant interface makes life easy. And thats is my final conclusion. Already thinking about your next birthday or Christmas gift ? 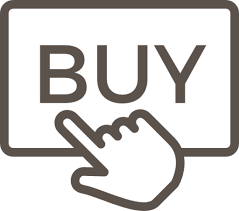 PUT CHRONOSYNC and CHRONOAGENT ON YOUR WISHLIST. You just can’t go wrong. GoodSync is the latest software in a series of highly reliable, easy-to-use products from Siber Systems, the makers of RoboForm. It uses an innovative synchronization algorithm that offers true bi-directional synchronization. 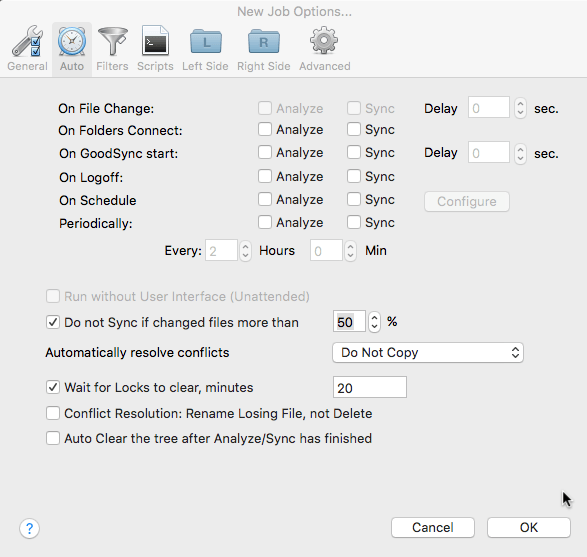 Goodsync can set automated tasks created by the user. 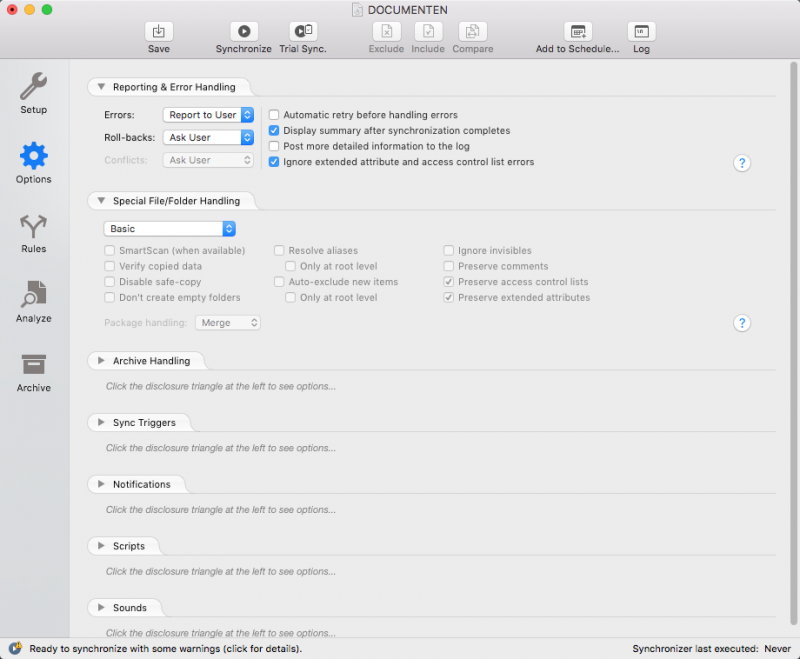 These tasks can be created with a variety of syncing options. This is the part where I think the beginning user should be carefull in his or her choices. The wrong choice can make data seem gone when you do not opt for incremental syncing. Goodsync keeps a backup ( gs-data ) in a special created map, where you can recover files. It is the overwhelming amount of options that make this utility not suitable fort he mac-novice but it is especially suitable to companies and experienced users. 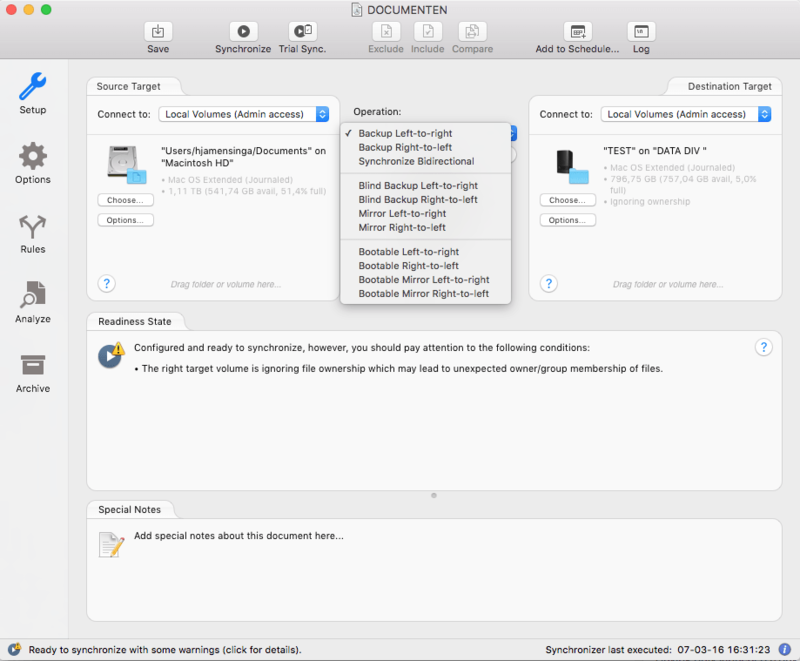 All created tasks can be exported, so whenever you feel the need of a clean OSX install or re-install Goodsync, just one click will import all your tasks ready for action. 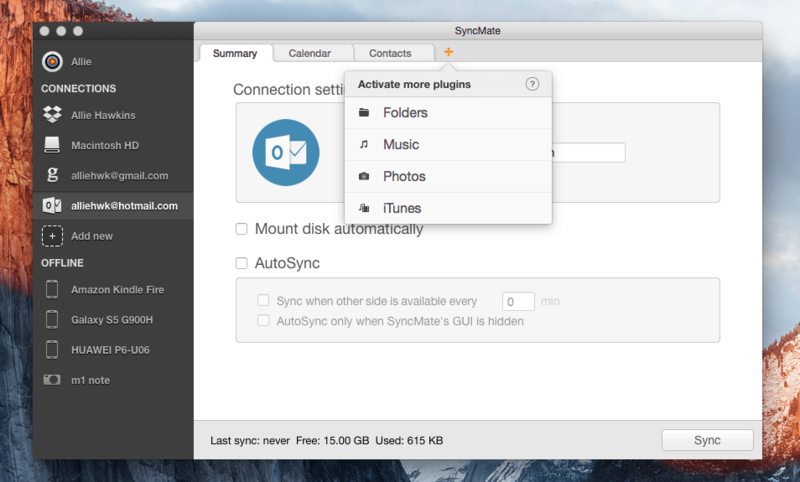 When all tasks have been setup, Goodsync works really well . The interface is not as intuitive as some competitors, and is due to the amount of options. 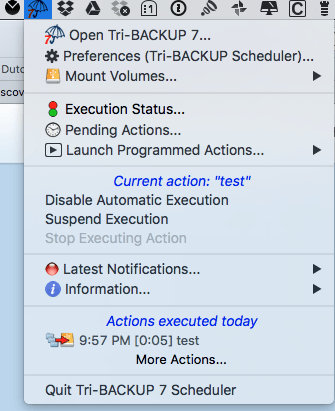 Another good and usefull feature is the logging of all actions. A logging which shows errors should they occur for any reason. Block-level sync really speeds things up. Compression is only done in NTFS. 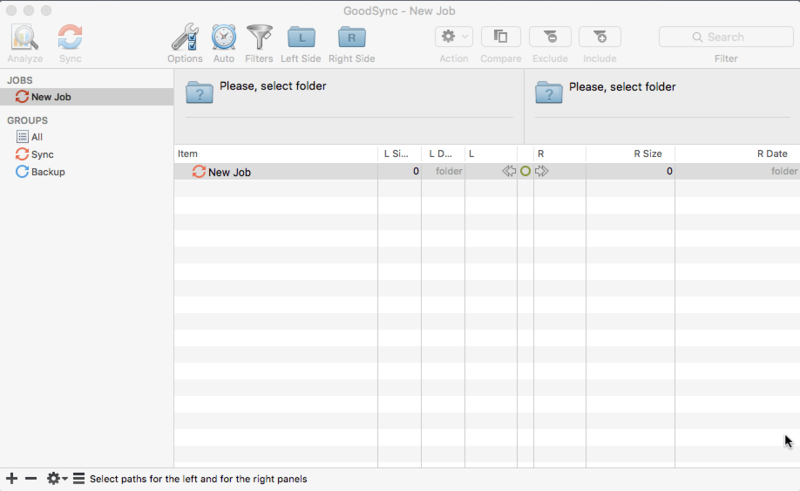 Goodsync is one of the best utilities for experienced users and companies. Its versatile and offers loads of options. A good interface and task description help you making the right choice. You just can’t go wrong using GoodSync a solid and reliable performer. 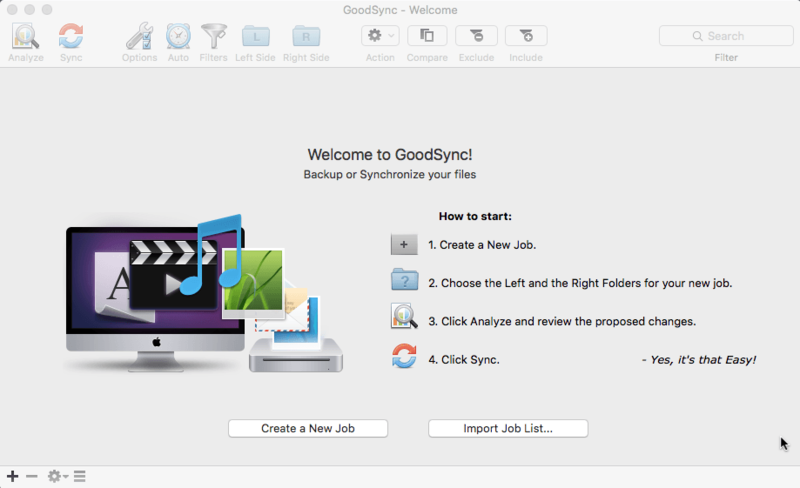 Goodsync Desktop for Mac or Goodsync2Go for use with an portable (usb) drive makes your choice complete. Carbon Copy Cloner is a way to make diskfailures annoying rather than fatal for your hard work. 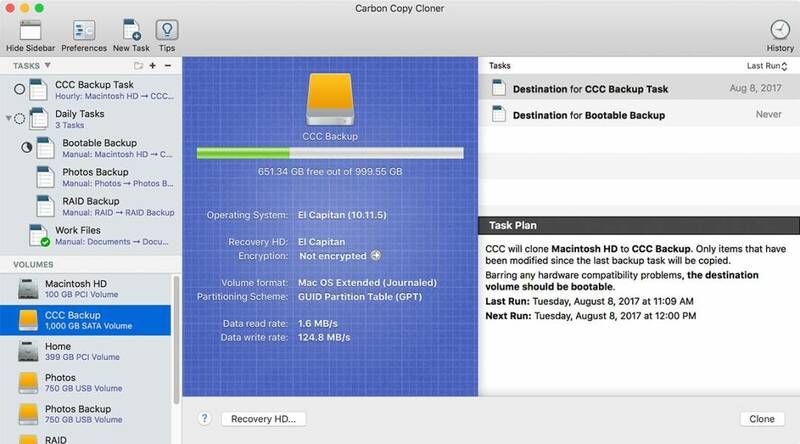 CCC backs up any or all of your files and it also optionally creates a bootable external hard drive. Ofcourse you can use Time Machine for your backup, its easy and works well. However is won’t be sufficient in all cases. Eventually it will happen to us all, the error or performance that makes us decide for a clean install of OSX. And for those who don’t want all their stuff stored on a cloud like Dropbox or Google, a personal external NAS backup is needed. This is where software like Carbon Copy Cloner is essential for performing the job. At launch Carbon Copy presents a clean interface with a sidebar showing the task discription and a window showing : source, destination and schedule buttons. In addition to task overview the sidebar also shows all mounted volumes. 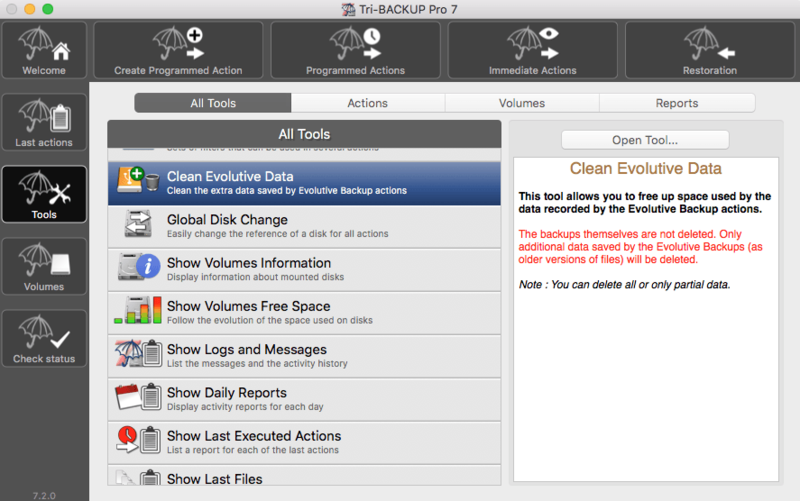 Thanks to the intuitive interface it is really easy to setup backup tasks. You don’t have to be a wizzard to accomplish these task setups. Everything is straightforward really. 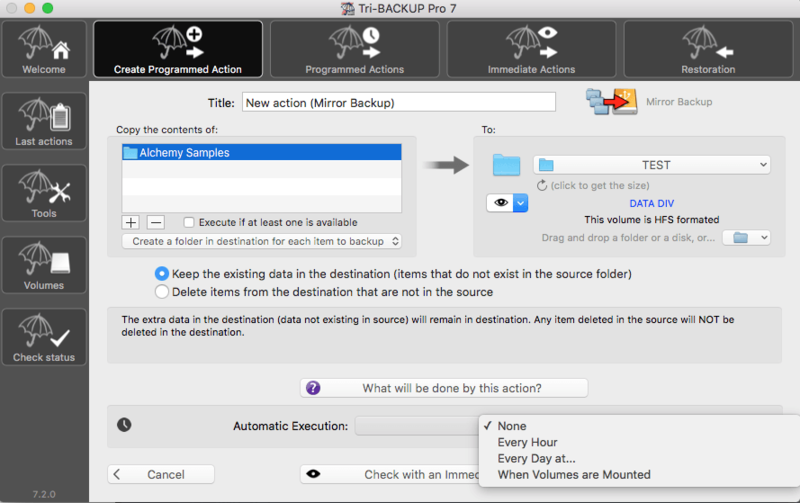 After choosing the ‘source’ and ‘destination’ you add a schedule for the backup task. You can also clone the entire bootdisk to an external unit. Normally CCC runs in default ‘simple’ mode. All advanced settings are hidden. 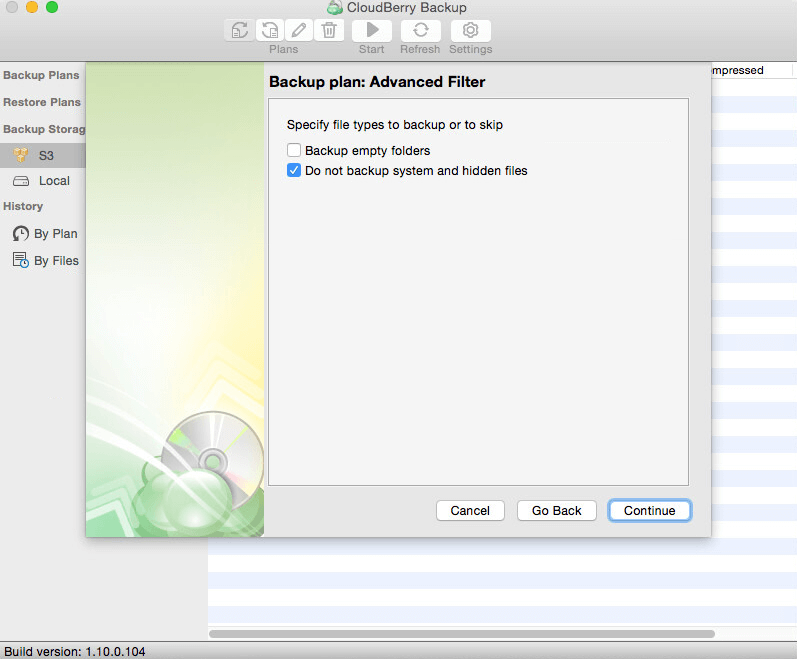 Opening the advanced settings offers a fine tuning for the backup task and the SafetyNet feature. It is possible that you may run several operations, and option for ‘wait till task is finished’ is optional to have CCC run all tasks even if there is a time-overlap. 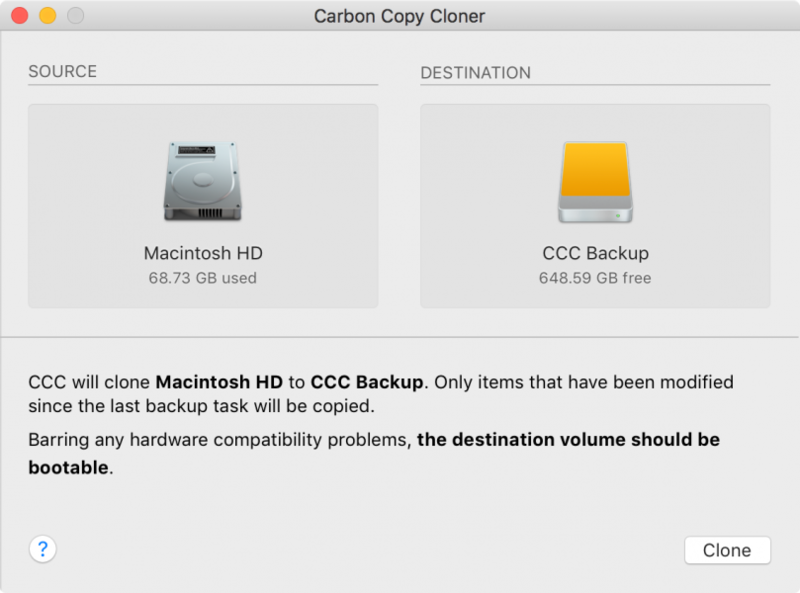 Create a bootable clone of your hard drive, but also keep copies of your recently deleted and changed files — just in case. The interface is clear and easy to use. The ‘Menu bar.app’ is providing the neccesary information. So if you’re really serious about a backup utility and safety, this is your pick. Carbon Copy Cloner feels like doing the required job with ease and speed. A simple interface explaining the desired job(s). This is what you’re backing up, here’s where you’re backing it up to, go. It supports more then enough options for most users. 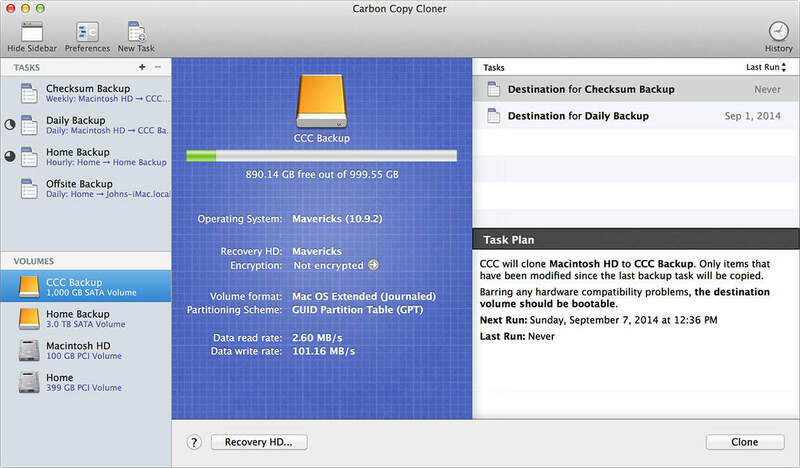 Carbon Copy Cloner is the easiest backup utility, and not complaining about authorization issues with external discs. Just Drag & Drop your source and destination and you’re on your way. 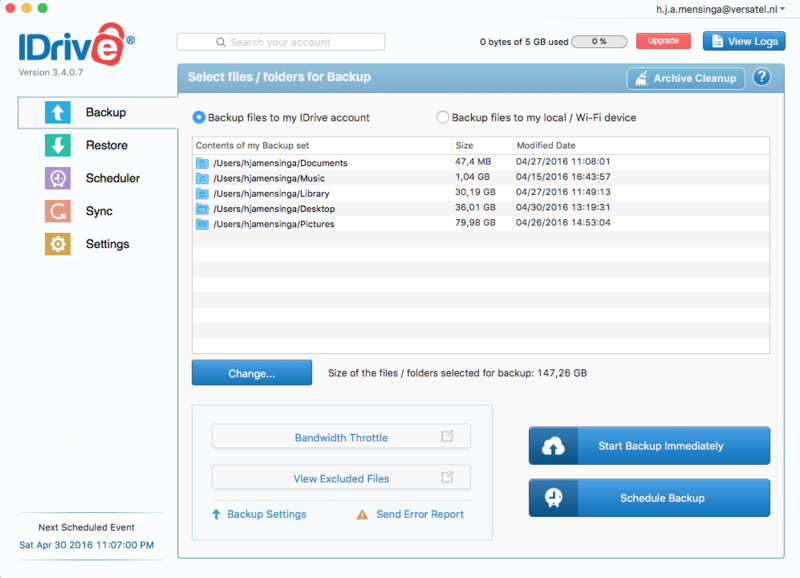 Fully auto scheduled backups complete the great options.